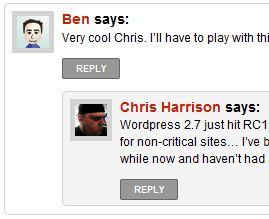 In case you missed the first post related to Wordpress 2.7 comments, please check it out. As promised here’s some starter CSS for stylizing comments in your Wordpress 2.7-compatible theme. I hope to release a few more over the coming days that can be added to existing themes pretty easily. You can see this in action here on the site. This “style starter” will give parent comments and their children rounded corners. (Browsers that don’t support border-radius (or -moz-border-radius or -webkit-border-radius) won’t see rounded corners.) This has been tested in Firefox 3.0.4, Internet Explorer 7, Opera 9.6 and Safari 3.1. It may require some tweaking to get it to fit properly into your theme. One of the features I love in Wordpress 2.7 is the ability to have threaded (nested) comments up to 10 levels deep. While viewing comments on this – or any Wordpress 2.7-powered – site, you’ll notice a Reply button (assuming nested discussions are enabled). Clicking that will enable you to reply directly to that comment, keeping discussions in context. This is probably not all inclusive, but here is the basic structure for ol.commentlist as it exists in the Default theme’s comments.php. To take advantage of the new discussion features, I copied this file over to my own theme. (You’re more than welcome to roll your own.) For many of the elements, more than one class is used with it. Where applicable, I’ve chosen the most descriptive class (e.g. li.comment instead of li.alt) as the parent for child formatting. Here is the CSS I’m using to stylize my comments below. (You can see an example of the nesting here.) Even though a number of the selectors are currently unused, I am keeping them in place in the event I decide to do something with them in the future. WebKit now includes CSS Masks. I’ve been messing with the site a bit, so if things look screwed up, forgive me. Seeing as this isn’t that far of a departure from what I already had on this site, I’m considering this Version 13.1.0. I’m trying to clean up my templates, add some additional functionality that I’ve been missing, and add little enhancements here and there. This is Phase 1… Phase 2 will include the switch over to the Sandbox theme framework. Sandbox supports rich semantic markup, microformats, etc. and I can’t think of a reason not to use it… I’ve already started the process of converting the site over to Sandbox, so you can expect that switch to be made soon. The decision behind this switch is based on making the site more forward compatible. Mozilla has already announced that Firefox 3 will have built-in support for microformats. I hope the Internet Explorer team will follow suit with IE8. We’ll see.